Clad in a white spacesuit with his country's green, white and red flag decorating his left shoulder, Luca Parmitano emerged from the International Space Station to become Italy's first astronaut to walk in space on July 9, 2013. Prior to his excursion, Parmitano shared a taste of his home country with his crewmates. Clad in a white spacesuit with his country's green, white and red striped flag adorning his left shoulder, Luca Parmitano has become Italy's first astronaut to walk in space. Parmitano, a 36-year-old pilot in the Italian Air Force, took his spacesuit to internal power and floated out the airlock hatch of the International Space Station (ISS) on Tuesday morning (July 9), starting his — and Italy's — first spacewalk. The spacewalk officially began at 8:02 a.m. EDT (1202 GMT). Accompanied by NASA astronaut Chris Cassidy, the two ISS Expedition 36 flight engineers were slated to spend more than six hours outside the orbiting outpost preparing it for the addition of a new Russian module and performing additional installations on the station's backbone truss. "I like to think that the work we are going to do outside is very important because we have a dual objective," Parmitano said in a NASA interview before launch. "One is connected to science, because we will be retrieving some experiments that are currently outside the station." "The other part of the [extravehicular activity, or EVA] is connected to technology and maintenance, and in a way what we're going to do is make the space station a better station so that it can last longer and be more efficient," he said. The spacewalk is the first of two planned for the pair to be conducted this month. Parmitano, who is 41 days into a scheduled five-and-a-half month space station stay, was named a European Space Agency (ESA) astronaut in 2009. His current flight, however, is on behalf of the Italian Space Agency (ASI), under an agreement between ASI and NASA. 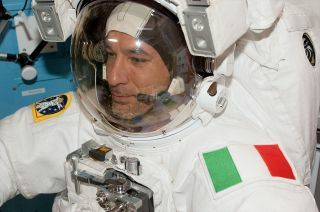 In addition to Italy's flag, Parmitano is also outfitted for the spacewalk with ASI's logo, which is printed on the cover of his wrist-strapped checklist. Parmitano's mission for the ASI on the space station has its own title, "Volare"— "to fly" in Italian — to symbolize the search for new frontiers and opportunities for discovery. In preparation for his historic Italian spacewalk, Parmitano shared a taste of his home country with his crewmates in the form of specially-prepared space food. "Being Italian, I have a very special relationship with the culinary arts," Parmitano told collectSPACE.com earlier this year. "One my projects was to share Italian cultural food with my colleagues." "When I made the simple request of creating a menu for myself and my crew, the Italian Space Agency jumped on the request," he said. A printed menu for the special Italian dinner, welcoming Parmitano's five American and Russian crewmates to "Il Nodo" ("The Node"), was displayed in the Unity module on Saturday (July 6). The meal offered a traditional antipasto appetizer, lasagna and pesto risotto as the first courses, eggplant parmesan and for dessert, tiramisu. "The chefs that went to work on this [meal] created some fantastic menus of food that can be extremely enjoyable," Parmitano described. "The great thing is that it's also very healthy — all low in sodium and very balanced with all the diet requirements." Parmitano's outing on Tuesday marked the first time that the Italian flag was worn by an astronaut in the vacuum of space, but it wasn't the first time the green, white and red banner has flown in space. The first Italian citizen to reach orbit was Franco Malerba, a member of ESA's 1989 astronaut class and a payload specialist on board space shuttle Atlantis' STS-46 mission in July 1992. Malerba flew with the NASA-ASI Tethered Satellite System (TSS) experiment on what was the 150th human spaceflight to circle the Earth. In the two decades that followed before Parmitano's flight, four other Italian astronauts followed Malerba into space, including Maurizio Cheli, Umberto Guidoni, Paolo Nespoli and Roberto Vittori. Italy's first female astronaut, Samantha Christoforetti, was chosen with the same ESA candidate class as Parmitano and is scheduled to fly to the International Space Station in 2014. Click to through to collectSPACE.com to see Luca Parmitano’s Italian space food menu. You can follow Parmitano and Cassidy during their six-and-a-half-hour orbital excursion by watching the spacewalk live on SPACE.com, courtesy of NASA.